Last week we had the pleasure of being invited to a showcase of NYC Cosmetics Autumn launches (and to celebrate the fact that NYC is now available in Penney's) as you can probably tell I have a real soft spot for NYC Cosmetics and just to make the spot softer (that sounds wrong doesn't it) all the products are under €4.00 (Four Euro... four hundred cents...you get the drift). The lovely ladies that are in charge of NYC here in Ireland are pretty "Awesome" (I am being American in honour of NYC) they are really excited about the brand and that helps us the consumer because they strive to get us the best products available from the brand. Some of the new launches are only available in America and Ireland, they know that if they love the products so will we. I count the lovely Fiona personally responsible for bringing the Blushable Creme Sticks to our shores. Sarah Jane Wai O'Flynn was on hand to talk us through some of the looks that she created with the new products and also chatted away giving us tips and tricks and telling us her favourite products. The models (who are two gorgeous girls from Fade Street) are wearing clothes from Penney's and how amazing do they look. Here are some of the new lashes that will be available to us later on in the year and remember for under €4.00. The always fabulous Art Donatella please if you have not checked out her Black Swan look check it out here it is amazing, Paula from Cornflakegirls Musings (check her out here) and moi. Lets get onto the products. First up is the Smooch Proof Lip stains I love the idea of lip stains but the reality of most stains is a intense colour with extremely drying effect and since my lips tent to verge on Sahara at the best of times they are not something I gravitate towards. NYC's offering differs as it is water based with Vitamin B which wards off the drying effect that most stains offer. The colours are build able you can build the stain but are also brilliant layered with a lipstick or gloss, a must have if (like myself) you wear intense colours. 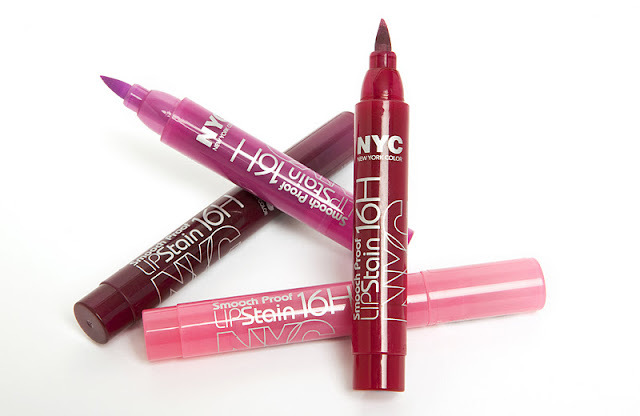 NYC Smooch Proof Lip stain is available in four shades (Berry Long Time, Champagne Stain, Forever Fresia, Persistent Pink) priced at €3.99. Next up is our Irish exclusive. 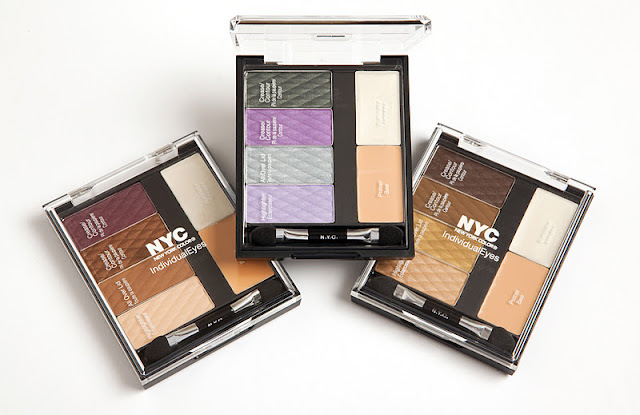 The girls fought hard to get this product on our shores and it is genius... NYC Individuals eyes Custom Compact. The compact have four eye shadows, an eye primer and a highlighter. Isn't it brill? Makeup hoarders like myself will have a separate primer and highlighter but I think it is genius that they are included in these palettes bringing a perfect face to the masses. The palettes are also set out in shades that complement different eye colours (green eye palette, blue eye palette). I think you will agree shows that NYC are geniuses that will one day take over the world. Here is my face on it I have Central Park (Green Eyes) and Big Apple Blush (check out the glow). I will be keeping my favourite for last, its no secret that I have been yearning for the Blushable Creme Sticks (read about it here) I love this product it does exactly what it says on the tube, If you have oily skin do not worry because the sticks are oil-free which dries down to a silky powder finish with Vitamins A, C and E. The colours are light and build able but in my opinion they are more than just a blush, they give a highlighted glow to the cheeks. Beautifully complex cheeks in just one swipe. All products available mid October 2011 from selected pharmacies and department stores nationwide. I highly recommend checking them out. These products look great. I have seen the stands but never done much investigation. Am really liking what I see here so will have to hit up Sam McAuleys soon. Here is my face on it I have. You make me LOL, so hard. Every time. Oh god, look at me being the only one reaching for a drink in that photo while the rest of you were listening intently to Sarah Jane. Oops! 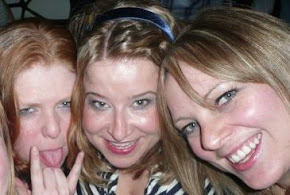 Thanks for the blog link, it was a great night.